Despite getting up at 6.30, I still didn’t manage to get started walking until 10.45. I really am going to have to NOT stop at Lancaster services for a coffee in future. I had 2 goals for the day: to do a bit of a scramble and to do a long walk to see if I’d got the stamina. I parked up at Glenridding car park for a whopping £7 for the day, although as it turned out it was less than a pound per hour. There are clean, free loos in the car park, and a cafe and postcards if you want them. The route goes past a camp site and then rises up alongside Mires Beck. I soon picked up 3 old men (on large Ramblers’ outing from St. Helens). They were either behind or ahead of me for half the day. I left them to climb to Birkhouse Moor (1st Wainwright of the day). A dog was roaming loose on the hillside and chasing sheep but I couldn’t see an owner, too far away for me to try to catch it too, and then what would I do with it, even if it did stay still long enough? Back on the path along a big wall for a long flat section. 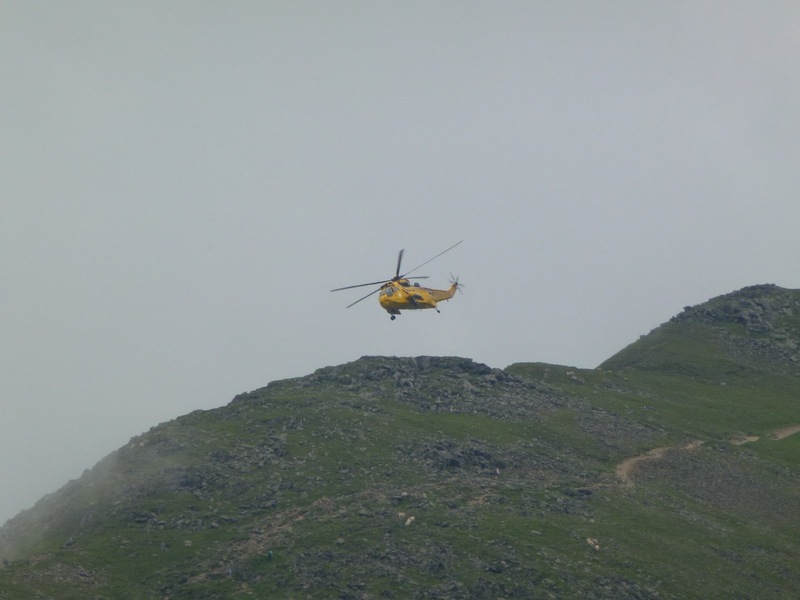 Over on St. Sunday Crag, someone was being rescued from the cliff. When I’d walked St. Sunday Crag I’d watched a rescue of someone on Striding Edge. Away from the wall to head across to Red Tarn, still flat so made up some time. Red Tarn is at the base of the climb to Swirral Edge and a Mountain Leader was about to take a group of children up there too. I knew he was an ML the minute I overheard him point out Geographicum lichen! Plus he got them all to check their bootlaces and talked about foot placement and 3 points of contact. The group commenced the climb and I stopped for my first lunch of pitta filled with hummous, tomato and basil so as to give them a good head start. However, when I got to the hard part of the climb up the edge, there they all were again so he let me go past. It’s a short section of scrambling and does require concentration and thought as to where to put your hands and feet but there is enough room to take the numbers of people. It was more busy with people coming down but waiting for them is a chance for a breather. What it does do is get you to the top very quickly. A father coming down with his son was berating him for going down on his bum and bullying him in a very unpleasant way, such a contrast with the group coming up and I so wanted to intervene and kick dad off the mountain but anyway I kept quiet. Helvellyn (2nd Wainwright) is a big plateau at 950m and I stopped at the first cairn and chatted to a couple of men about whisky. 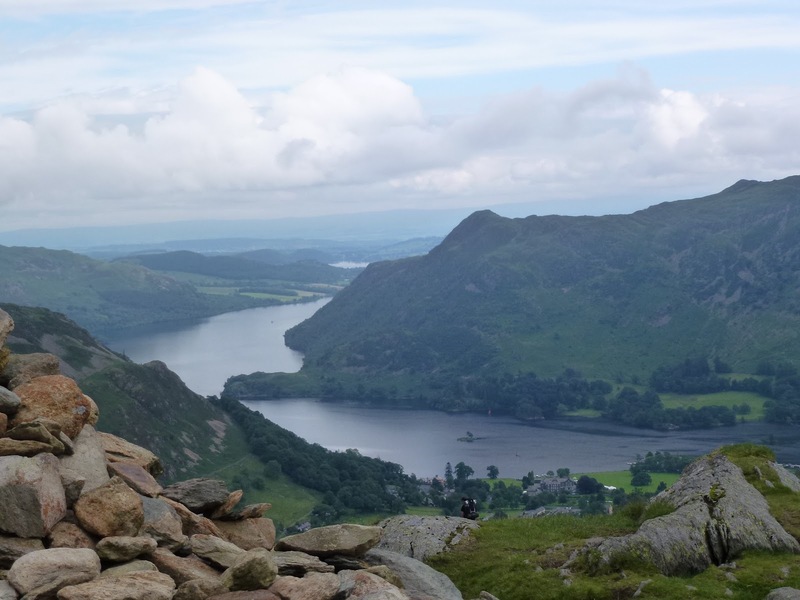 Then I moved on to the trig point and chatted to a couple of Indian men who had come up the easy way from Thirlmere with no gear, no map, no compass. They took my photo and I took theirs. My first trio had turned up by then and we all advised them how to get down and back to their car but I didn’t see them after that so they must have gone a different way, which would mean a long walk along the road. Me on the top, doing the bent knee pose! I treated myself to an energy bar in the shelter and then set off for Nethermost Pike (3rd Wainwright) and then Dollywagon Pike (4th). 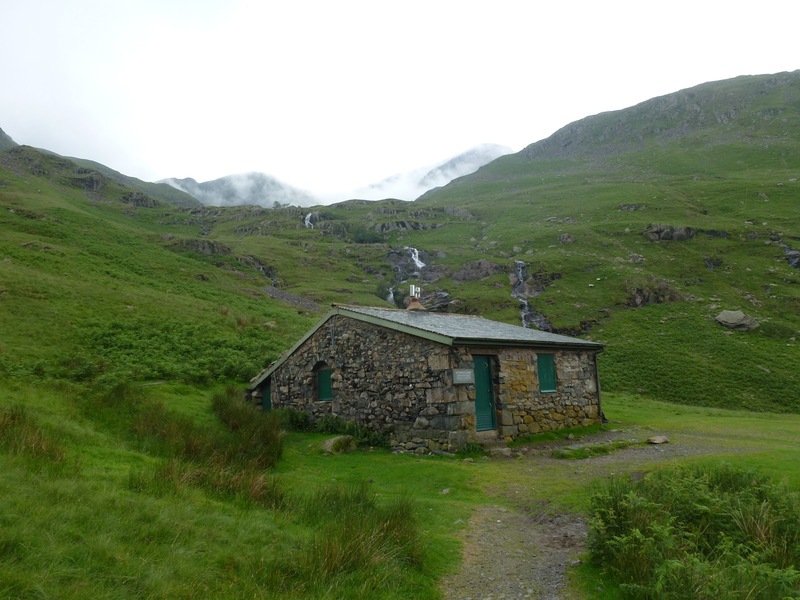 After Dollywagon it was 3/4 of an hour to get down to Grisedale Tarn, although the path is good. Here I had my second lunch, identical to the first and it rained for about 10 minutes. I was feeling quite tired and still had a long stretch to get back to Glenridding. I only managed to do this by setting myself intermediate goals of places to look for and aim for. 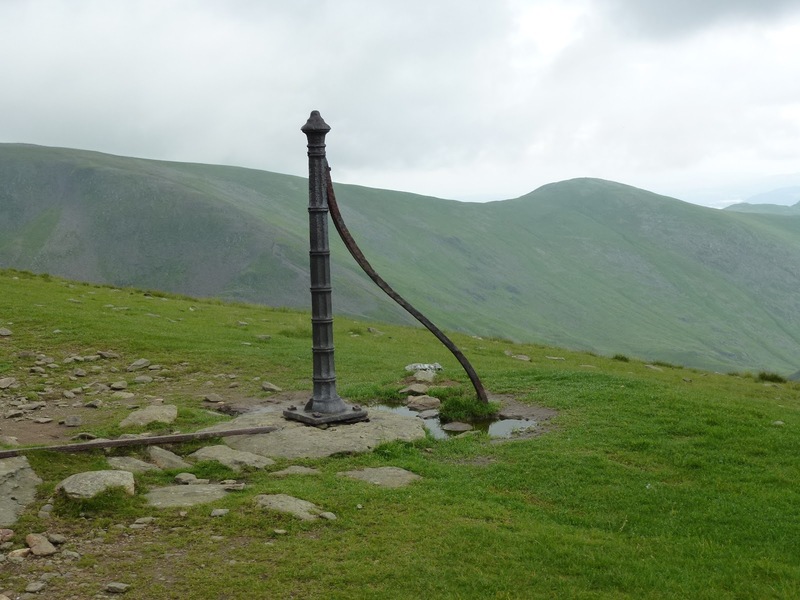 It was a lovely walk and although I’d seen a few people I hadn’t actually passed anyone since Helvellyn. It took 2 and 1/4 hours to get back, the last section was a bit tricky. 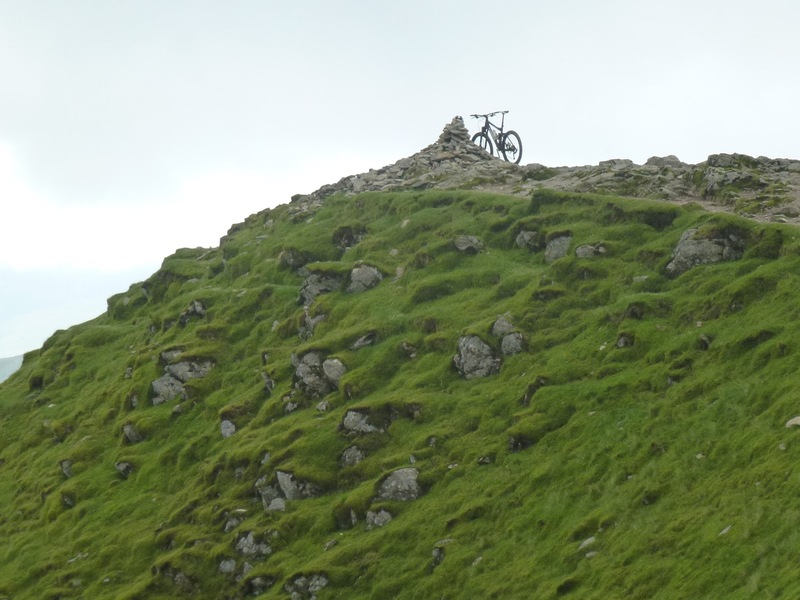 I had an option to go up in order to get back down, staying on Access Land and on Rights of Way, or to go off the Access Land and along marked paths on the contour. I chose the latter as I just couldn’t face any further up by then and was cursing every little rise. This took me across a fence with barbed wire into a mucky old wood with lots of bog and rotting trees. I slid my way out of that to go through over head high bracken which wet me through and then down onto a real track leading to a house and then onto the main road which frankly I was quite glad to see. I left Glenridding at 6.30 and was back home at 8.30, not bad! I did 17 km which is 10.5 miles – mountain miles! so the stamina is ok as although I felt tired and had a few leg and foot aches and pains, nothing was unbearable. 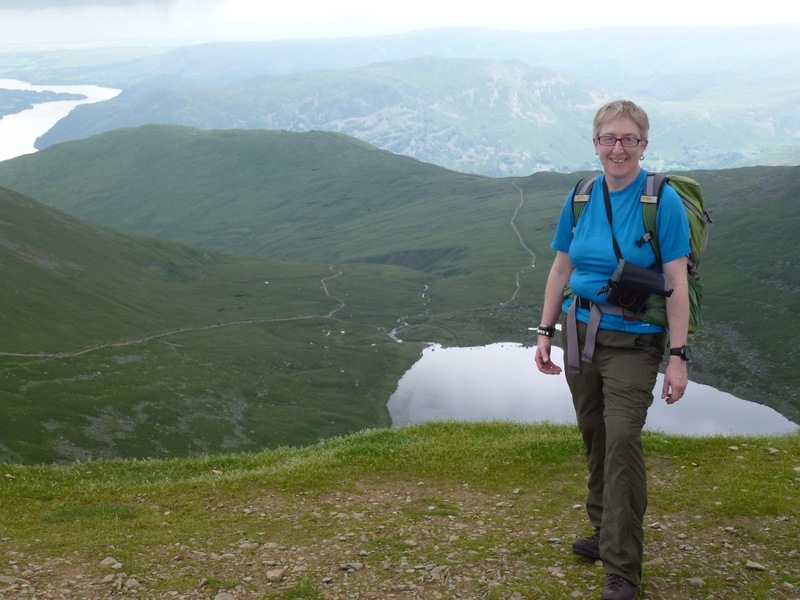 And I did the lesser of the 2 Edges leading to Helvellyn, so all I need now is my pal Cath to do the other Edge! Well done my darling.Am not sure how I prove I'm not a robot. Excellent, well done! I've still got my Lakes post in a draft, but will try and finish it. It was like pea soup when we went up Helvellyn! I think I know who "Anon" is! So long as I'm right about that, they are definitely not a robot!Pea soup best consumed at table with a spoon! But good fun, when you have to use the skills for real. A proper challenge then.